Intrigued by the title every time I saw this book in the offerings of http://www.historybookclub.com, I finally had my resistance broken down when it went on sale. Who knew how interesting the stories would be about how the borders of our states were drawn. There’s a lesson in U.S. history on every page, and the tight yet thorough, informative yet not academic writing style even makes it a fun read. Superb maps make all the difference, too. 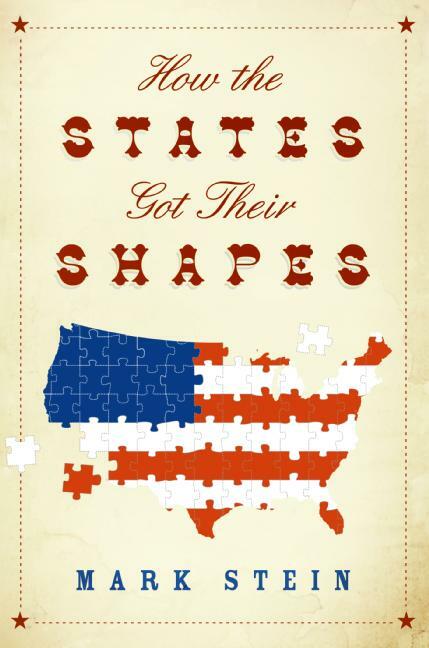 Author Mark Stein uses a similar tease to introduce each of the states — for example, “Why is there a semicircle at the top of Delaware?” — and most pique the curiosity just enough to get you to the 6-7-8 pages on most of the states. A story — and a good one — lies behind nearly every state in this 304-page Smithsonian Books publication. If you’ve ever wondered why the Four Corners area where Colorado, Utah, Arizona and New Mexico meet is the only place in the country where that happens, the answers include lost or inebriated surveyors, wily members of Congress, royal decrees from English kings, and of course religious prejudice, among others. Watch our for those Catholics! You probably recall from your grade school history classes that Britain’s King Charles I, a Catholic, created Maryland to provide a place in the New World for England’s Catholics. Somewhat the same thing happened down on Maryland’s southern border. The piece of land that extends between the Atlantic Ocean and Chesapeake Bay now called the Delmarva Peninsula (Delaware, Maryland and Virginia, get it?) was originally Virginia’s, but when King Charles created Maryland, the Virginia colonists already there took issue. The king went with a compromise to keep the peace, and now three states share a finger of land. Similar state and even national borders were impacted by religious differences and fears, and not only involving Catholics. They are relatively few, though, compared with the way state borders were draw for political and commercial reasons. Rivers form natural boundaries, and access to water and waterways come into play of course. It’s the little niches of states — like Minnesota’s Northwest Angle that juts through the 49th parallel that makes up most of the U.S. border with Canada — that make for informative, interesting reading. Slavery has a role, too, as does “acquiring” land from Native peoples — or pushing them off it. For some reason I hadn’t been aware of one factor about how the states got their shapes: equality. Congress, as it drew borders, was highly conscious of forming states that were relatively the same in area so that each would be likely to have an equal say in the federal government. That said, Congress in the past isn’t all that different from Congress today, and the pieces of state lines that skirt around a town or angle off a north-south or east-west axis or don’t line up with a neighboring state might have a very practical rationale behind them. Or a very political one. Or a very profitable one, profitable for someone.